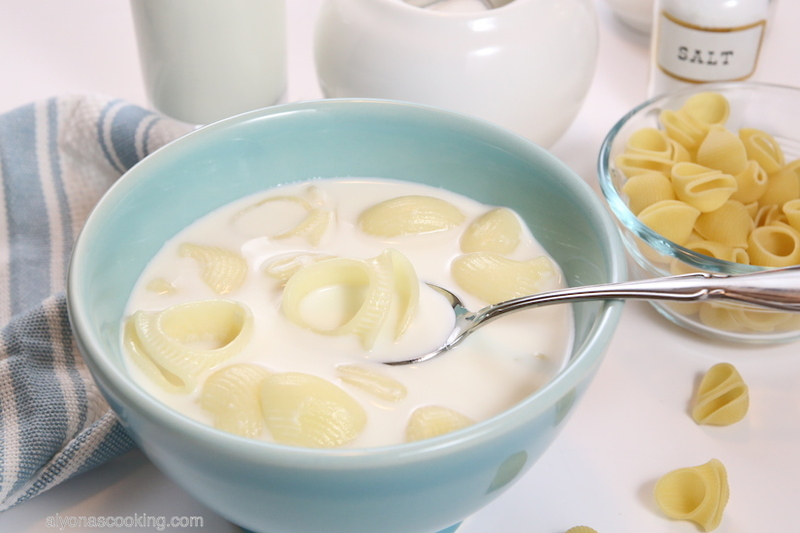 Pasta with Milk was made in our family very often for breakfast and even once in a while for light supper. If you are from a Ukrainian or Russian background then you probably know what this semi-sweet Milk Soup is all about. 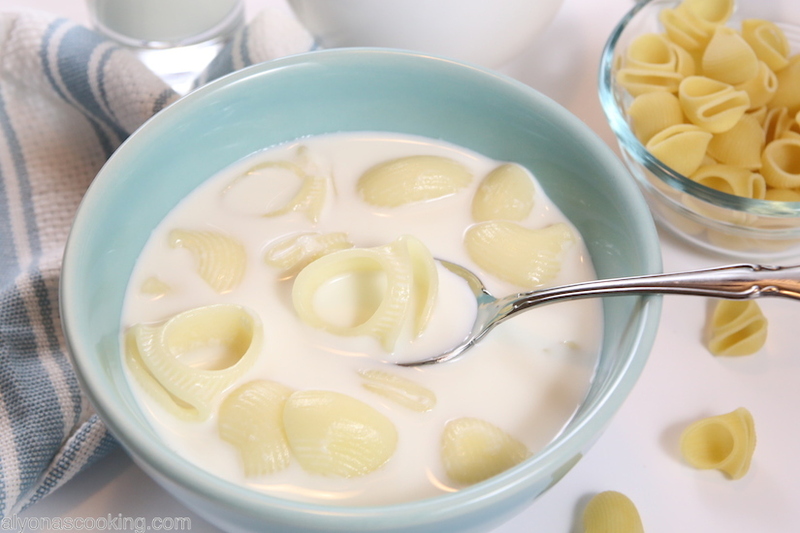 Known also as Molochne, this delicious bowl of Macaroni and Milk is favored by most adults and children, especially throughout the Slavic culture! 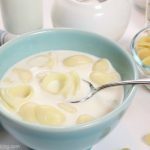 Aldente chewy pasta and milk make for a wonderful and refreshing little meal that happens to be very kid friendly due to it’s semi-sweet taste. Any grain, pasta or rice can be used in place for the pasta. I prefer bite sized pasta or a healthy grain like hulled millet but whatever you really have on hand will work . 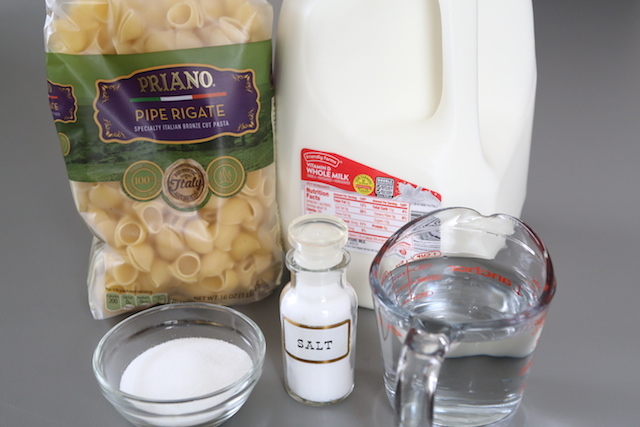 If you want to use up some of that milk sitting in the fridge this is a great and fun way to do so. Note: When handling with milk please don’t walk away from the stove, as milk can rise over the rim of your pot before you know it! ? 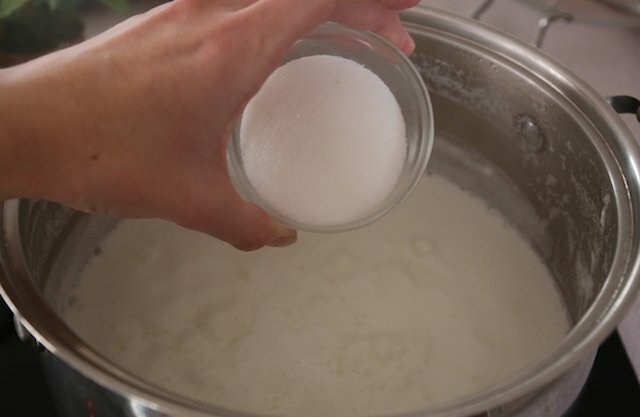 How to prevent milk from sticking to a pot? This water step helps the milk not stick to your pot. 2. 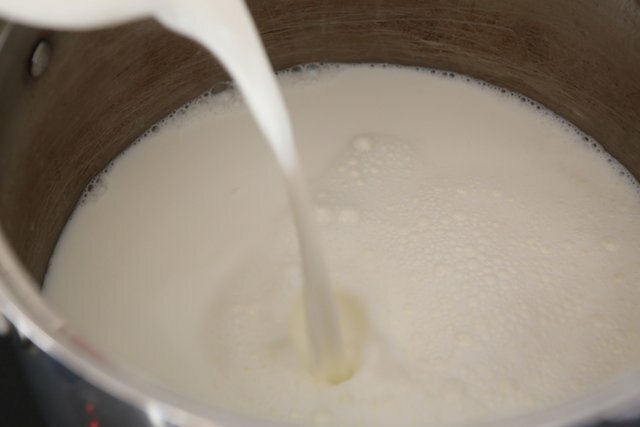 Once water boils, pour in all the milk and bring to a boil over medium heat, stirring occasionally (about 12 min). 3. 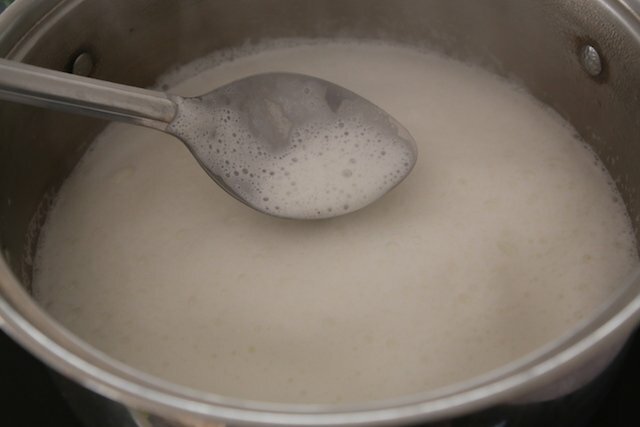 When milk starts getting really foamy, it’s going to boil soon. Keep stirring until milk bubbles. 4. 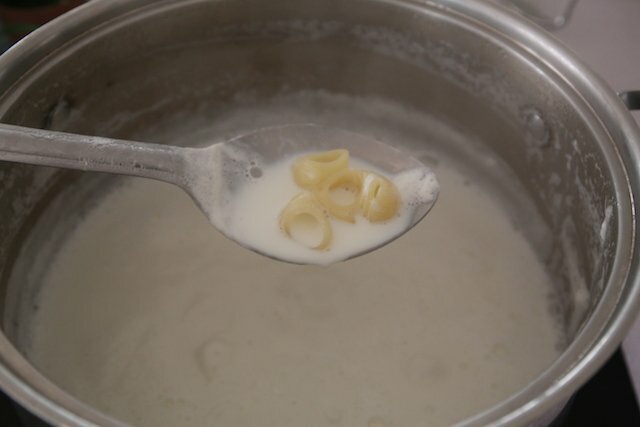 Once milk bubbles, quickly add in the pasta and boil over med-low heat for 7-8 minutes. 6. Do not exceed more than 8 minutes to cook the pasta as the pasta will continue to cook while sitting. 7. When pasta is al dente; add the sugar stir and remove completely from the heat. Pasta with Milk was made in our family very often for breakfast and even once in a while for light supper. If you are from a Ukrainian or Russian background then you probably know what this semi-sweet Milk Soup is all about. In a large pot bring 1 1/2 cups of water to a boil. 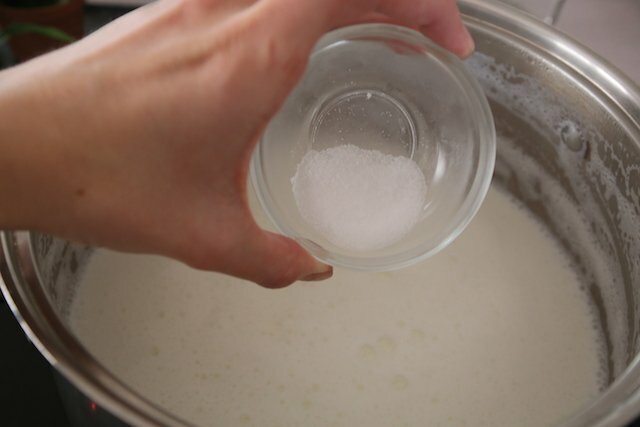 Once water boils; pour in all the milk and bring to a boil over medium heat, stirring occasionally (about 12 min). 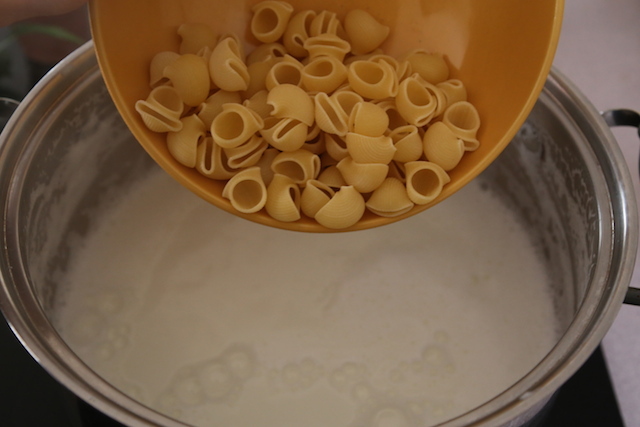 Milk will get really foamy, keep stirring until milk bubbles then quickly add in the pasta & salt and boil over med-low heat for 7-8 minutes. Thank u for this! I have been sick with a head cold and all i can think about is the macaroni cereal my mom use to make for me! Noone in my moms family had any idea what i was talking about. My sister found the site and shared this with me. Oh nice, I’m glad our blog helped you out with making the macaroni cereal:) Thank you for taking the time to leave a comment, Annell. I appreciate it! I’m glad to have found your recipe. I’ve been looking for recipes to use up almost a gallon of milk left by houseguests, but most of what’s out there uses less than 1-2 cups (mostly w/ a lot of butter and cheese). This sounds like a good way to use a lot of milk very quickly. I think I’m going to try it with quinoa and fiddle around w/ some fresh herbs…probably basil as I have literally pounds of it to use up. Hopefully, the basil will allow me to cut out the sugar. Thanks for the idea. Wow, hello Alyona ! I am so happy I stumbled on your site… This is my childhood dish and I always wanted to make it for my kids but didn’t know how to, thank you so much?